This past weekend, my aunt and uncle were visiting from out of town, and we all stayed in a nice hotel in lower Manhattan for a few days. Audrey and I got to be tourists; we walked over the Brooklyn Bridge and visited the Statue of Liberty. Our room actually had a telescope in it through which you could see the statue. I grew up in this area, visiting the Statue of Liberty on class trips or with the Girl Scouts, but I hadn’t given her much thought as a grown-up. As our ferry, totally jam-packed with tourists speaking different languages made its way from lower Manhattan to the island where the statue stands, people poured to the side of the boat with a view of the approaching statue until all I could see from my seat on the top deck was arms holding up cameras to capture this view. The builders and architects wanted the statue to be more than great in stature; they wanted her to evoke emotion- and she does. When we got on the island, we each picked up handheld speakers for the audio tour that was included. 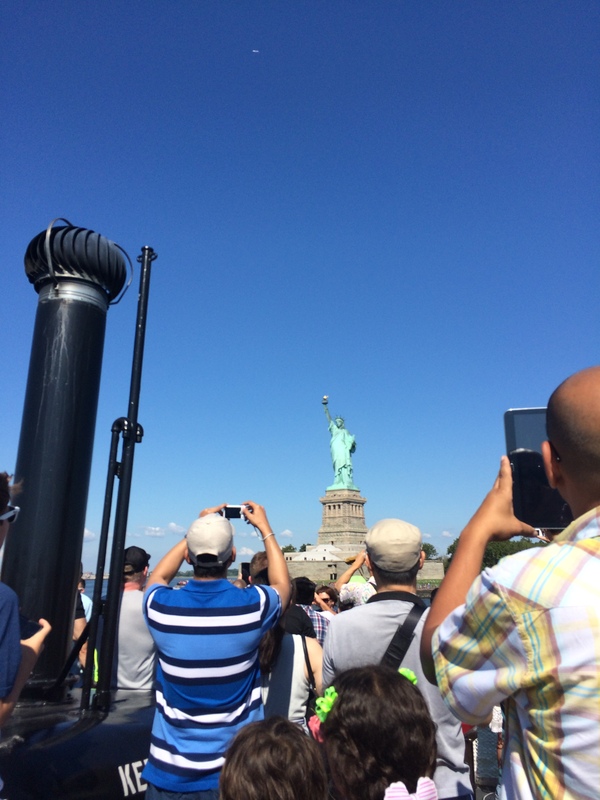 The tour was really well done, and as I walked around the perimeter of the statue, there were a lot of facts that interested me: the fact that even though she stands so solid, her copper covering is only as thick as the width of two pennies. The fact that even though she has stood for freedom for so many, women were not allowed present on the opening day. Instead, suffragettes protested in boats from the water. But my favorite thing to think about was the way she was built to face the Old World, so that people arriving would see her, turned towards them. Who positioned her at exactly that angle? How different would the viewing experience be if she’d been turned another way, even slightly, I wondered as I walked around from her back towards her face. The apparent subtlety of the direction we face can be deceptive. “Don’t turn your back on me.” “Don’t turn away from me.” “Who will you turn to?” “I’m sorry- I have my back to you…” These expressions are tired and overused; much of their poignancy has been lost. I started to think about the importance of the direction we face a couple of years ago. Audrey was still sleeping in my bed, but I had a habit of always sleeping on my left side- something I’d picked up during pregnancy when they advise you not to sleep on your right side during your last trimester. Since I was sleeping on the left side of the bed, with her on my right, this meant I turned my back to her. For a three year old, it was palpably uncomfortable for her when I slept that way. When you turn your back towards someone, you basically cede all involvement. When you turn towards someone, you show interest, you make eye contact, hearts face one another. I felt her discomfort so much that soon it was no longer an option to sleep on my left side and turn my back towards her. A couple of years before that scenario, my husband and I were going through some tense times. We had our first child, moved suddenly to another state, and then he left his job with a steady paycheck to tour the world doing music. While he was gone for up to a month at a time, our communication was very poor – emails, sometimes a phone call. When he came home, I was used to fending for myself and let him know that. As a result of all that tension, there started to be nights where we shut off the light, each turned our back to the other, and we went to sleep without any more words. It was such a contrast from our past nighttime routine. When we were newlyweds, after a few moments in the darkness, when I thought he was asleep, he would whisper, “Goodnight to you.” And most nights in those more recent days, I slept with my cupped ear on his chest listening to his heart beat until I got just tired enough and then I’d roll over to my own space. Turning our backs to each other was painful. I felt like crying on those nights, but instead, I just went to sleep. Without physically turning away or towards someone, we still have an inner stance. We can face someone and still give them the “cold shoulder.” In relationships they call that stonewalling. Hurtful words can be spoken, but wordlessness can be even more painful. Fighting words mean exactly that- you’re still in the fight. No words often means apathy and indifference. There is usually more hope for someone who feels strongly against something than for someone who is indifferent. Marriage counselors worry more about a couple that doesn’t feel much of anything than a couple that is angry and fighting. The direction we face says a lot about the health of our relationships- with our spouse, with God, and with life itself. Are we involved and in the fight? Or have we given up? You see, the French had a secondary motive in gifting us the statue. It was to be an reminder to their nation to keep fighting their own revolution and achieve democracy as the United States had. She faced towards the Old World and France, not just to welcome tired immigrants, but as an inspiration- a reminder to stay involved- to keep fighting. “Liberty Enlightening the World” is her full name. It took me five years to realize the truth of something a friend wrote to me, a young pastor who had lost his wife five or six years before my husband died. Dan and I had attended her funeral. He is remarried and lives in South America now, and I’d written him to tell him the news and of my struggles. “I suspect your lack of certainty about God really lies in feeling absolutely betrayed by Him, and finding no other means to express your rage and disappointment and sorrow than by giving him the theological version of the silent treatment,” he wrote. The silent treatment, the turning away in bed with no goodnight, actually speaks volumes. When you’re hurt and angry, the greatest affront you can give to someone is to pretend that they don’t even exist. It was only in the last couple of years that I started to realize how right this man was to call me on my theological version of the silent treatment. I knew he was right, not because I’d been enlightened about suffering or because I’d read enough to prove that God exists, but because I felt the change in my own inner stance. Nothing miraculous had occurred; I hadn’t moved, or remarried or started my life over. Everything is pretty much the same. But I was facing God again. I had turned towards Him, and it felt different. This is how I knew I must’ve been turned away before. Sometimes we know something only by its opposite. A couple of years ago, I wanted to pray a blessing over Audrey each night – so I started putting my hand on her head before bed and praying something I’d heard in church benedictions. It comes from Numbers in the Old Testament: “God bless you and keep you, make his face shine upon you, be gracious unto you, turn His face towards you, and give you His peace.” Soon, she also had memorized it and modeled after me, pressing very hard on my own head and saying this prayer. “Is that how hard I pressed on your head?” I asked. “Yeah!” she replied, and we laughed. Just as I felt her distress when I used to sleep with my back towards her, I see the delight come over my daughter’s face when I stop what I’m doing during the day and give her my full attention, when I turn towards her and show her that I care and want to be involved in what she’s doing. What could be more powerful than this image of the Creator doing just that- turning His face towards you, letting you know He is interested, involved, and willing to fight for you? I never tire of saying these words. The world encourages us to do and get done. But sometimes we have to stop, be still and make sure we’re facing in the right direction before we take action. And sometimes we can’t get any movement going at all. Don’t despair. Check your inner stance. Just turning towards something or someone may be enough for now. Oh, this is so powerful Julia. The idea of shifting your stance, of turning toward, of facing, is something that can be subtle but also monumental. The angle of the Statue of Liberty may have been agonized over by those who understood its significance. I haven’t been a tourist in NYC yet, not since I was a child, but we planned to take our children to see Ellis Island and I’m so glad I read this first. Thank you as always for your wisdom and the beauty of your words. Thanks Dana. Always value your words. I turned towards my son this morning as he asked me to play with him. The few minutes of building legos together in the morning rush made all the difference to him and to me! Thank you! Thank you for sharing your heart, for turning toward us. I was reading your words as part of my quiet time for the morning. You always have a morsel for me to savor.